The Skinny: A giant stone God with the spirit of a warrior trapped inside awakens when he is angered by the injustices bestowed upon his village by its new evil Lord. 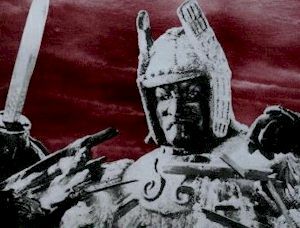 Daimajin opens in a small Japanese village in feudal Japan being overthrown by an evil overlord named Samanosuke (Yutaro Gomi). He kills everyone in the royal family except the young Princess and Prince Tadafumi, who go into hiding on the mountain where the statue of the God Majin stands. Legend has it that Majin has the soul of a warrior trapped inside him, and must not be angered lest there be grave consequences. After ten years of repression and starvation, an attempt is made to restore the old regime but Samanosuke is simply too powerful. That is, until he decides to mock the God Majin and has his cronies try to destroy it by pounding a chisel into the statue's head. Majin wakes up in a really bad mood and goes on a wild rampage to set things straight.